At BizJetJobs, we are often asked about typical pilot salaries in the U.S. The ongoing pilot shortage is one reason why employers around the world want to know how to attract the best talent. U.S. salary budgets are projected to rise by an average of 3.2% in 2019, up slightly from 3.1% for 2018, according to WorldatWork’s 2018–2019 Salary Budget Survey. For aviation-specific salary numbers, see the BizJetJobs pilot salary survey. Unfortunately, not every pilot who deserves a pay raise gets one—and the reasons why might not be what you expect. If any of the following behaviors sound familiar, it’s time to make some changes. 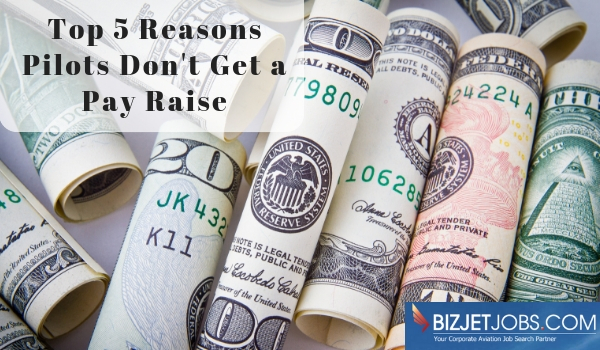 Even if you know how to ask for a raise, to get one, you actually have to ask. Almost two thirds (37%) of workers have never asked for a raise, a recent PayScale survey found. And be explicit: make sure you say you’re requesting a salary increase, not just a promotion. Bottom line: if you don’t ask, your employer will assume you’re satisfied with your salary. When employees discover they’re underpaid, they often start looking around for a new job. When employee turnover becomes a problem, it should prompt companies to pay their employees more. So do some salary comparison. To find out what other people with your skills and experience are making, a great first step is to check out the BizJetJobs pilot salary survey. We have pilot salary data for Aviation Managers, Chief Pilots, Captains and First Officers by aircraft. Use it as ammo when you talk to your boss about a raise. The corporate flight departments we work with at BizJetJobs are interested in being competitive when it comes to talent. Visit the BizJetJobs Pilot Job boards to see who’s hiring in your aircraft. Great time to ask for a raise? My performance review! WRONG. People often ask for raises at performance reviews, but that’s generally too late. When you just did something great. This includes things like saving your company from losing its number-one client and helping cut costs (finding the best-priced fuel or saving on hangar costs). You’re worth your weight in gold. When the company is in the black. After a big earnings report is released and your company’s looking bullish, you have more negotiating power. There’s more money in the budget and things are looking up. If your company is going through a decline, or has recently made a large investment with growth in mind, now isn’t the time. When your boss hands you more responsibility. If you’re taking on significantly more work, you should be compensated for it. This includes when you were hired for a primarily flying role but have just taken on management or desk work. You might need this raise because Christmas is coming, to better support your spouse or a forthcoming baby, for a much-needed vacation or because you’re eyeing your new dream home in a better neighborhood. But revealing these personal situations will probably decrease your chances of getting a raise. Salary raises are objective business decisions that should not be based on emotions. You want your employer to think, “we need to keep this person on board. It’s actually less expensive to give him or her a raise than to go out and hire someone new.” What matters with this thought process is that you deserve the money, and the only way to demonstrate that is through clear-cut examples and objective data (see reasons 2, 3 & 5). Once you decide to ask, know what you’re worth and the timing is right, there’s one final key step to asking for a pay raise – and getting it. Really ask yourself: what does this company gain by having me on board? You’ll need to demonstrate that. All this time, you should have been keeping a record of your contributions. Numerical data on things you’ve done that have improved your company’s profitability or productivity are best. You can also mention the contributions you’d like to make going forward. This entry was posted in Blog, Data & Trends, Salary by Amanda Jenkins. Bookmark the permalink.